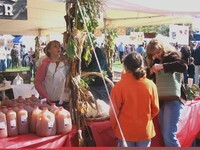 Greene's 33nd Annual Apple Fest! Welcome to the 33rd Annual Greene Apple Fest! This event is sponsored by the First United Methodist Church in Greene, and is held annually at Greene Ball Flats Park. This Family-Friendly event includes apple related demonstrations, crafters, a car show and much more! Event Date: Saturday September 28th, 2019. Crafters & Food Vendors Welcome! The 2019 application and cover letter are now available! Feel free to download the letter and follow the instructions to apply!